I have recently set out on a personal endeavor to seek out the best taco our world has to offer. From extravagant cantina eateries in bustling cities to authentic taquerias in Mexico, I have tried HUNDREDS of tacos. 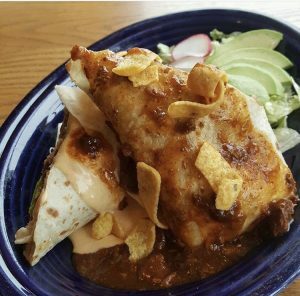 I have come to the conclusion that Madison holds one of the top spots for contemporary Mexican dishes, at a place called Tex Tubbs Taco Palace. 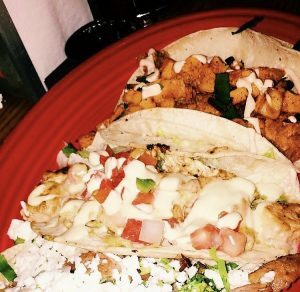 So if you are a taco-fanatic like myself, sit back and soak in this review. I have always said “Go big, or go home”, and Tubb’s Frito Burrito embodies this saying to a T. This bad boy is like the Walking Taco we all know and love, but on an entire new level. You can stuff it with fried chicken or fried avocados, and enjoy it in all its smothered glory. The only reason I wouldn’t give it 5 stars is because I hold a grudge for it making me go up a pants size. The other menu items I want to feature are a couple of the signature tacos from their all-star lineup. From left to right, Traditional Carnitas, House-Smoked Chicken, and Southern Fried Chicken. The first two are for those who appreciate a good, traditional taco. Carnitas are by far my favorite, and while these are slow-roasted and showered in queso fresco; they do not disappoint. The Southern Fried Chicken are a favorite of my friends, offering up fried chicken mixed with SWEET POTATO hash. Colonel Sanders has nothing on the Tubb’s. While these are just a few of the dishes Tex Tubb’s Taco Palace has to offer, it is definitely enough to give you a taste of what it’s all about. Located on Atwood Avenue towards Madison’s East side, this taco heaven holds a place in my heart as a top spot on my journey for the ultimate taco.